We have developed one of the most functional and easiest platforms to collect, systematize and control reviews on your sites. 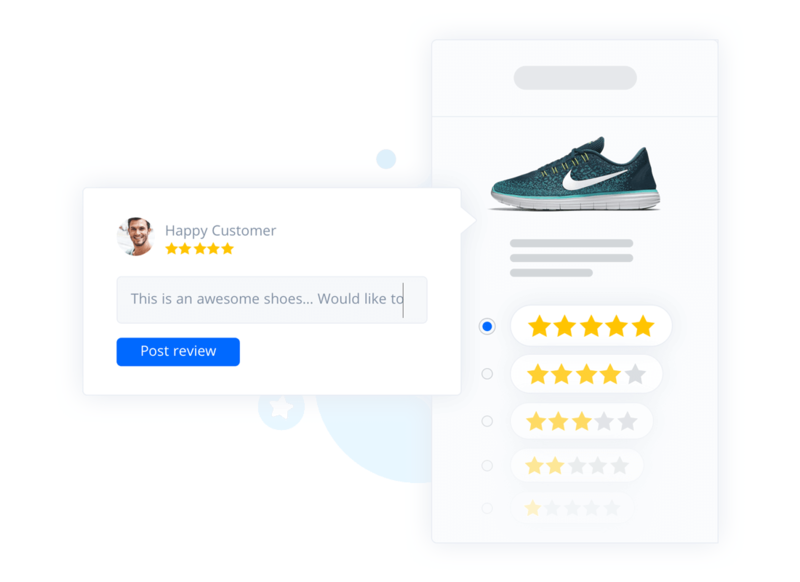 Using a customer reviews widget, you will have access to millions of users, all over the world, who share their experiences and create positive buzz about goods and brands. The widget works on all eCommerce platforms. It allows you to relieve the server load and increase website speed. Its many settings help to make the platform truly unique. After buying a product or service, the customer receives an email with an invitation to leave a review. You do not have to wait until a customer goes to your site. By involving customers in a discussion of your product, you maintain their loyalty and increase the probability of repeat buying. After the publication of a review, You can award the user for his/her opinion after the publication of the review. 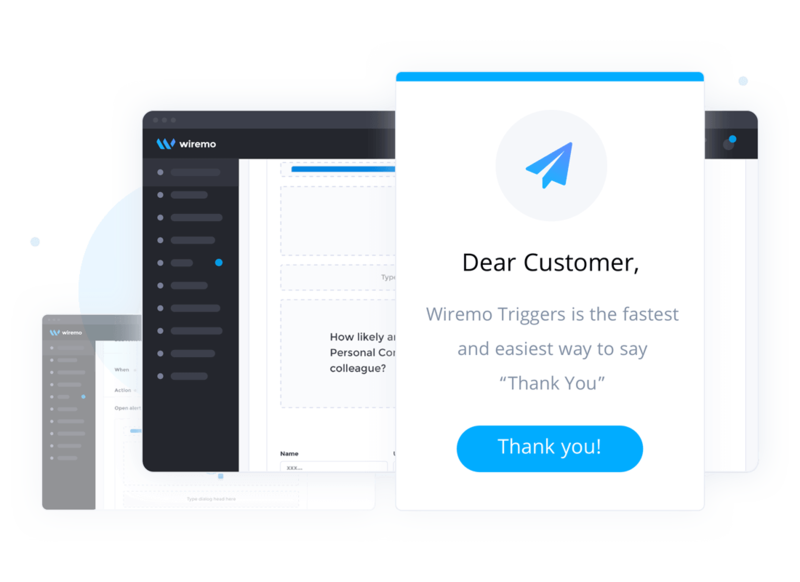 With the help of Wiremo Triggers, you can stimulate your loyal customers and automatically reward them by means of promo-codes and bonuses. This function will help you to be aware of the latest reviews and respond to the requests and opinions of customers in a timely manner. Triggers tool has two functions: Pop-up for the instant reward (say "Thank you" or award with promocode) and Conversation - a personal window to communicate with a user and solve all problems. Thank your customers for their reviews and build trust by addressing their feedback. 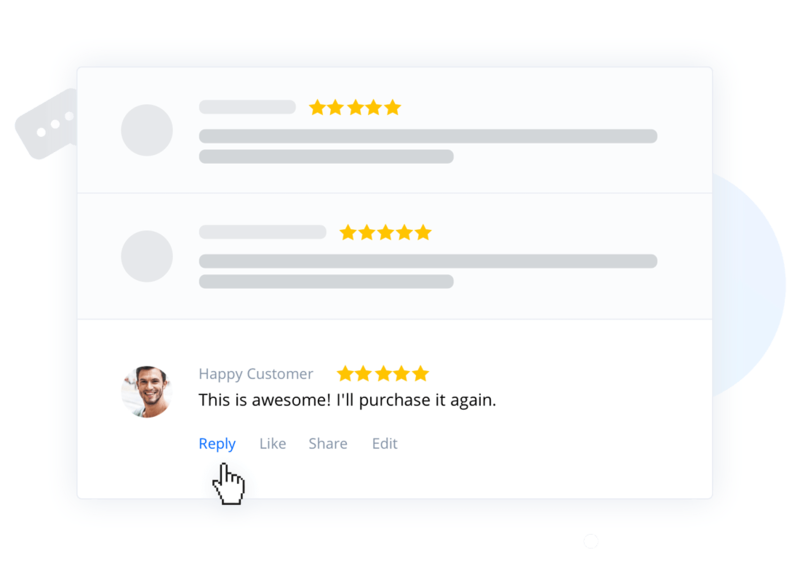 Mark reviews, share your impressions from a communication with a customer without logging out of the application – it takes just 2 clicks! It is now easier to upload pictures of a product and place it within the review. With our widget, you will collect pictures from customers while building their trust. A picture of your product in the review is not only an organic image in search engines, but also an increased conversion by 25%. A widget design looks good on both mobile devices and on big screens. You can insert the Wiremo Carousel widget anywhere in your site and show messages to your customers, if required. You control the work of the platform on your site. Our tech consultants are available 24/7, ready to answer any of your questions. We will help you integrate our widget into your website as well as to set it up for proper operation. Feedback widget Wiremo supports a wide range of languages. It can be used on any website to show users reviews in their native language. 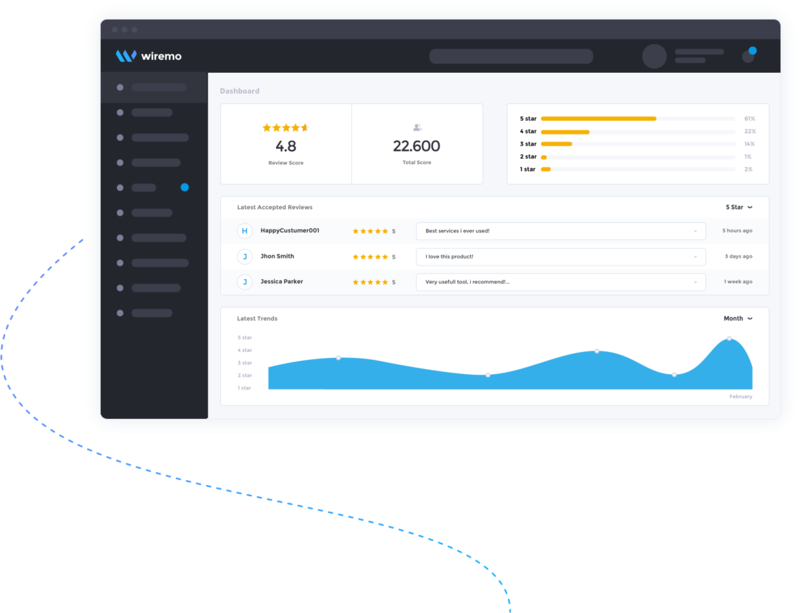 Wiremo’s functionality gives you an ability to monitor feedback in real time as well as to request statistics for further analysis. This is a powerful marketing tool. We give you an opportunity to evaluate widget’s functionality absolutely free of charge. During the first 14 days you are exempt from paying any subscription fees for using our product. Platform integration, adaptive design, real-time statistics, and an intuitive dashboard are just some of the many widget capacities. There is an extensive range of integration possibilities for creative tasks: personalized design, several widgets on one page, AJAX initialization, synchronization of reviews, and many other features. Wiremo reviews widget is not a single use solution. We focus on results and work on the improvement of our platform every day. We understand that your profit depends on our work and we do our best. There is an authorization through all popular social networks: Facebook, Twitter, Google+, as well as automatic wall cross-posting and sharing. This gives you a great opportunity to get social signals for search engines and increase website traffic. Wiremo Carousel allows to embed widget anywhere on your website and set up an uninterrupted display of new reviews. 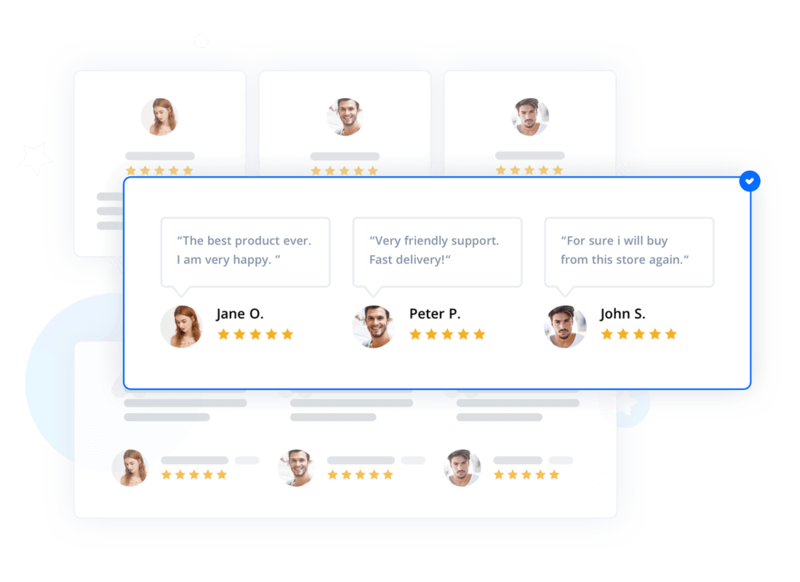 As a way of gratitude, right after the publication of a review users get an opportunity to open a pop-up window containing a promotional code or a discount link. The feedback collection system supports structured data markup through schema.org. This enables faster indexing and improvement of the website’s position by keywords. 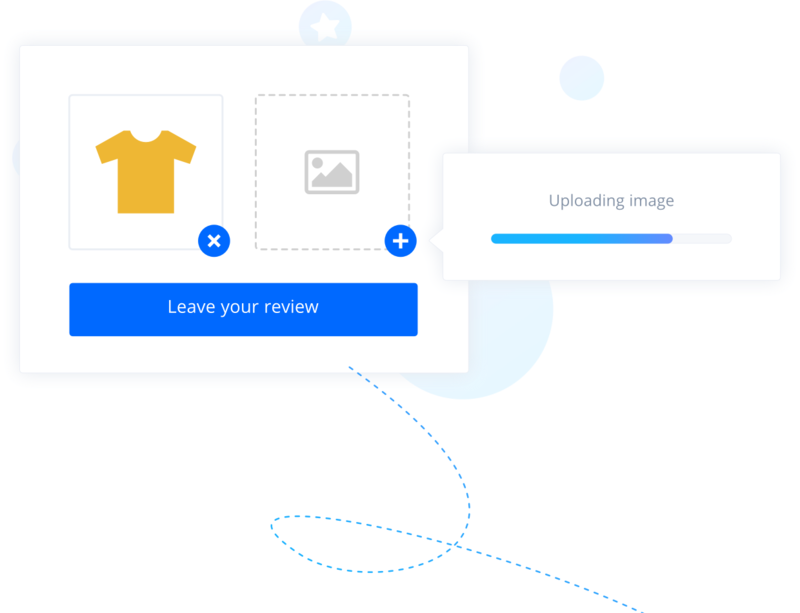 A clear image of your product in the review increases the user’s involvement. It serves as a proof that your product is real and corresponds to the stated features. A solution to disputes and conflicts should be immediate. You can begin a private conversation, by means of Wiremo, and solve customer issues. Your users will appreciate personal support, and participation of the company, in solving their problem. All reviews go through moderation. You will receive quality and useful reviews that are appropriate for your product. You can change or delete a review if it is offensive or contains profanity. You cannot change the number of stars. 14-days Free Trial. No credit card required.